I need your help everyone!!! So you guys know hubby and me have Salted Culture which stands for Shining a Light Towards Entertainment, Diversity & Culture. We highlight artists, entrepreneurs, bloggers, community leaders and small business owners through our weekly FB LIVE Series, on-scene correspondence, behind-the-scenes sneak peeks and so much more! We are currently in the running for up to $50,000 in grants from FedEx AND additional prizes including printing, office services and website help to name a few. It takes less than 30 seconds (yes we timed it..lol) and your vote could help change our lives! 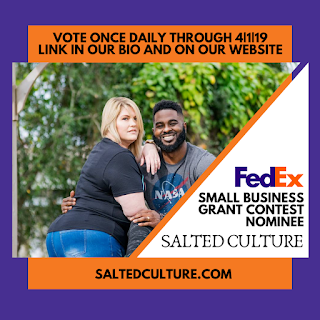 You can get more information about Salted Culture here and when you are ready to show some love please click HERE and then the orange button to vote! Remember you can vote once every 24 hours! Feel free to post your vote screenshot on our fb page or let us know somehow that you voted, showing us love and support so we can make sure to thank you!